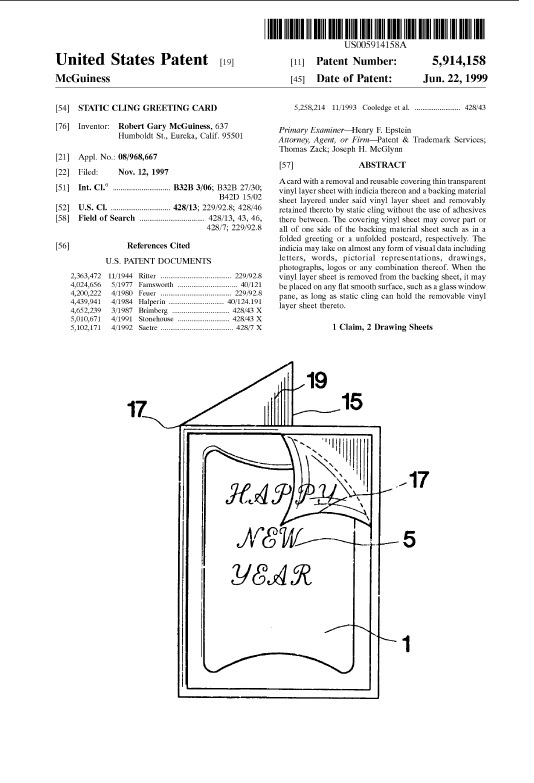 Happy New Year to everyone in the patent world! A new 35 USC §101. The Supreme Court broke the one we had. We need a law that protects all inventions, and doesn’t exclude a whole class of inventions merely because they can be reduced to a simple-sounding concept. A method that includes at least one non-mental step is not abstract. It may not be novel, it may not be non-obvious, but it is not abstract. Likewise, a product or machine is never abstract. A new 35 USC §102. Although the one we have is just a few years old, it never worked right. The most fundamental concept of any patent system is prior art, yet we don’t have clarity about what is or what is not prior art. Does a sale or use have to be disclosing or is the fact that the sale or use is known enough? Does “secret” prior art apply to obviousness? These are things we need to know. A new 35 USC §311 that is more fair to patent owners. Inter Partes Review may be here to stay, but the process can be unfair to patent owners. There is no standing requirement — a petition can be filed even if the patent owner has not asserted or even threatened to assert the patent. A patent owner can be subjected to multiple proceeding, sometimes simultaneously, and even if the patent owner wins there is essentially no estoppel against relitigating validity in the courts. Even after litigation is started, an accused infringer can use Inter Partes Review to change the claim construction (BRI) and the burden of proof (preponderance). What happened to the presumption of validity. You and your elves have a lot of work to fix this. If it fits in your bag, how about a presumption in favor of an injunction? The Constitution promised exclusive rights, but the Supreme Court seems to think otherwise. How about limiting claims to what is disclosed and enabled in their accompanying specification, instead of invalidating claims to important inventions under §112? Thanks, Santa, and Merry Christmas!